Can a better environment produce happier and smarter zebrafish? 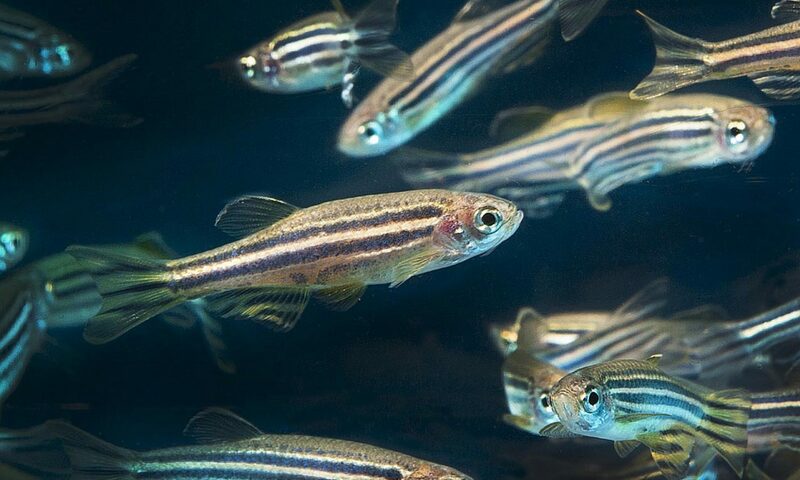 Zebrafish are model organisms that are widely used in many different fields of research ranging from ecotoxicology to neuroscience. Native to streams in the Himalayas, they are now most often found housed in small, barren, transparent tanks in labs around the world. Despite their ubiquitous distribution and use, zebrafish welfare has not been extensively studied. The addition of environmental enrichment has been shown to alter zebrafish behaviour and brain development. However, different types of environmental enrichment have not yet been compared in terms of their impact on zebrafish welfare. My current research examines which environmental enrichments (adapted and derived from features of their native aquatic habitat), if any, are preferred by lab-reared zebrafish. Over the course of my Ph.D. in Animal Behaviour and Welfare (under the supervision of Dr. Georgia Mason), I will also be investigating whether being reared with these preferred environmental enrichments improves zebrafish welfare, confers cognitive benefits, and/or enhances brain development. What aspects of the freshwater environment affect the survival of wild Atlantic salmon embryos through winter? In Eastern Canada, Atlantic salmon embryos incubate in the gravel riverbed from late October to early May, during which time they experience challenging and variable winter conditions. Rapid and inconsistent ice formation in the fall, followed by heterogeneous, oxygen-poor groundwater seeps through winter and dramatic scouring and sedimentation in the spring breakup period may all affect whether an embryo survives to hatch. During my MSc at the Canadian Rivers Institute (under the supervision of Dr. Rick Cunjak), I tracked the survival of wild Atlantic salmon embryos in four rivers through two winters. Using statistical techniques borrowed from chemometrics, my work demonstrated that no single environmental variable has a dominant effect on embryo survival. Instead, embryo survival is better explained by taking a multi-faceted approach and considering the interacting parts the winter environment together. How can we quickly and accurately assess salmonid embryo development? In hatcheries and research, water temperature is often used to mathematically predict salmonid embryo development. However, many developmental prediction models in current use are inadequate when water temperatures are close to 0ºC, and are therefore impractical in many coldwater systems. Furthermore, many published catalogues of salmonid embryology require complex histological techniques to assess specific developmental stages. In collaboration with Dr. Jennifer Nafziger and Alanah Annis, we have developed a tool for the practical identification of the developmental stages of Atlantic salmon embryos that requires only a dissecting microscope. We are also in the process of improving some of the mathematical prediction models using embryos and water temperature data collected over five years from eight coldwater Atlantic salmon rivers. When and why did “rock snot” proliferate in an important freshwater Atlantic salmon habitat? “Rock snot” or “didymo” are common names for Didymosphenia geminata, a type of algae that has been blooming in freshwater streams around the world in recent years. My BSc Honours thesis project (in the lab of Dr. John Smol and under the supervision of Drs. Josh Kurek and Kathleen Rühland) examined the historical context of these blooms using diatoms preserved in lake sediment cores from lakes in eastern Quebec. Many ecosystem managers and researchers assumed that didymo was an invasive species, introduced to eastern Quebec in ~2006 when blooms were first noticed. However, our work was among the first to demonstrate that didymo had been present in the region well before the assumed “invasion” event in 2006 and likely was triggered by an environmental change. We also found strong relationships between a shift in the diatom community in a didymo-free lake and increasing air temperatures and earlier river ice-out dates, consistent with the expected effects of climate change on freshwater systems. This indicates that climate warming, rather than human introduction, likely plays an important role in triggering didymo blooms. This work has featured by a number of media outlets, including CBC, Scientific American, The New York Times, and National Geographic.